10 years or so ago I was fortunate to rediscover de Tocqueville. I say rediscover because while I may have read bits of his two-volume Democracy in America I certainly didn’t read it in its entirety. In any case I’ve come to view de Tocqueville as a primary explicator of the American psyche. Given so much of life in our country revolves around physical comforts and gratifications and the chase for same who better than Alexis to give us the 411 on the whys. So in his own words, I’m going to reprint from the University of Virginia’s on-line version of Democracy in America several posts on the topic. The first is entitled above, it is from Volume II. Hope you enjoy. In America the passion for physical well-being is not always exclusive, but it is general; and if all do not feel it in the same manner, yet it is felt by all. The effort to satisfy even the least wants of the body and to provide the little conveniences of life is uppermost in every mind. Something of an analogous character is more and more apparent in Europe. Among the causes that produce these similar consequences in both hemispheres, several are so connected with my subject as to deserve notice. When riches are hereditarily fixed in families, a great number of men enjoy the comforts of life without feeling an exclusive taste for those comforts. The heart of man is not so much caught by the undisturbed possession of anything valuable as by the desire, as yet imperfectly satisfied, of possessing it and by the incessant dread of losing it. In aristocratic communities the wealthy, never having experienced a condition different from their own, entertain no fear of changing it; the existence of such conditions hardly occurs to them. The comforts of life are not to them the end of life, but simply a way of living; they regard them as existence itself, enjoyed but scarcely thought of. As the natural and instinctive taste that all men feel for being well off is thus satisfied without trouble and without apprehension, their faculties are turned elsewhere and applied to more arduous and lofty undertakings, which excite and engross their minds. Hence it is that in the very midst of physical gratifications the members of an aristocracy often display a haughty contempt of these very enjoyments and exhibit singular powers of endurance under the privation of them. All the revolutions which have ever shaken or destroyed aristocracies have shown how easily men accustomed to superfluous luxuries can do without the necessaries of life; whereas men who have toiled to acquire a competency can hardly live after they have lost it. If I turn my observation from the upper to the lower classes, I find analogous effects produced by opposite causes. Among a nation where aristocracy predominates in society and keeps it stationary, the people in the end get as much accustomed to poverty as the rich to their opulence. The latter bestow no anxiety on their physical comforts because they enjoy them without an effort; the former do not think of things which they despair of obtaining and which they hardly know enough of to desire. In communities of this kind the imagination of the poor is driven to seek another world; the miseries of real life enclose it, but it escapes from their control and flies to seek its pleasures far beyond. When, on the contrary, the distinctions of ranks are obliterated and privileges are destroyed, when hereditary property is subdivided and education and freedom are widely diffused, the desire of acquiring the comforts of the world haunts the imagination of the poor, and the dread of losing them that of the rich. Many scanty fortunes spring up; those who possess them have a sufficient share of physical gratifications to conceive a taste for these pleasures, not enough to satisfy it. They never procure them without exertion, and they never indulge in them without apprehension. They are therefore always straining to pursue or to retain gratifications so delightful, so imperfect, so fugitive. If I were to inquire what passion is most natural to men who are stimulated and circumscribed by the obscurity of their birth or the mediocrity of their fortune, I could discover none more peculiarly appropriate to their condition than this love of physical prosperity. The passion for physical comforts is essentially a passion of the middle classes; with those classes it grows and spreads, with them it is preponderant. From them it mounts into the higher orders of society and descends into the mass of the people. I never met in America any citizen so poor as not to cast a glance of hope and envy on the enjoyments of the rich or whose imagination did not possess itself by anticipation of those good things that fate still obstinately withheld from him. On the other hand, I never perceived among the wealthier inhabitants of the United States that proud contempt of physical gratifications which is sometimes to be met with even in the most opulent and dissolute aristocracies. Most of these wealthy persons were once poor; they have felt the sting of want; they were long a prey to adverse fortunes; and now that the victory is won, the passions which accompanied the contest have survived it; their minds are, as it were, intoxicated by the small enjoyments which they have pursued for forty years. Not but that in the United States, as elsewhere, there is a certain number of wealthy persons who, having come into their property by inheritance, possess without exertion an opulence they have not earned. But even these men are not less devotedly attached to the pleasures of material life. The love of well-being has now become the predominant taste of the nation; the great current of human passions runs in that channel and sweeps everything along in its course. Want more de Tocqueville click here. 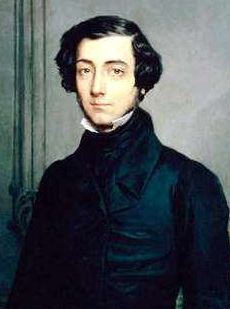 Gallery | This entry was posted in Personal #s, The American Economic Psyche and tagged American Exceptionalism, De Tocqueville, Financial Literacy, Money Management, Personal Finance, Personal Financial Planning, Retirement Planning. Bookmark the permalink.